I find the hardest time of year to homeschool is winter. Christmas and New Year’s have come and gone. It’s cold, it’s cloudy, and it can feel downright depressing some days. It’s a couple month stretch until the next holiday break and until warmer days. It’s not all bad of course. Since it will be awhile before outside activities can happen or holiday breaks, it gives you a really good chunk of time to work on school without distractions. It’s also the time, if you are like me, to catch up on those things you put off during warmer weather so you could be outside. Also, hot chocolate, big blankets, and large stacks of books. I’d love to give you some ideas to help survive these next couple of months of school with your kids. Science experiments are a great way to break up book work when you are needing something else to do. They could be experiments that are already in your science books or you could look up some fun projects on Pinterest. This would be something you need to be prepared for so you would make sure to have all the supplies you need. If you’ve been wanting to incorporate music into your homeschool, now is a great time. It allows the kids to have plenty of time to develop a good practice routine as there aren’t as many things pulling for their attention. Music will also be a good way to lighten the moods of everyone in the house. We have a subscription to Busy Kids Do Piano and it’s a great way for kids to start learning the basics of piano at a fraction of the cost of traditional piano lessons, plus all your kids can use the same account, which is super for large families. Need to get out of the house but it’s still too cold to spend time outside? Two words! Now is the time to visit the museums that have been on your list. Bonus. Check to see if your museum as memberships benefits like the ASTC Network. This will add a whole lot more places for you to see. You can also contact local places like fire stations to see if they would do a tour for homeschoolers. If you find a couple of families to go with they may be more willing. This is especially great for those days when no one feels well. If you have a large family and the sickness takes 1-2 weeks to get through everyone this may be especially needed. Documentaries are a great way to go deeper into learning in a new way. Find documentaries about what you are studying, about places you want to go, or whatever your family is interested in. You could even have special days where the kids get to take turns picking what the documentary is on. This is a great way for mom to get a break from teaching. This also gives kids variety as well so it’s not always mom teaching. Find some special activities you can do. Pinterest always has ideas if you need help thinking of something. A lot of time if you give the kids enough time, they will come up with something that they would like to do, you can just set the parameters. It could also be a reward or goal to get normal school work done if you are having trouble getting through lessons. If it’s warm enough that you can be outside for a while bundled up, you could look for tracks outside in the snow. Snow makes it way easier to look for animal tracks than in the summer. Take pictures of what you find and have kids draw them when you get back. You could also compare them online or in a library book to identify the different animals that have been scurrying around outside. Read some of your favorite children’s books and then watch the movie. You can discuss afterward what was the same and different from the book to the movie. Give the kids an opportunity to think about how they would have done it differently. Even though it feels far away, spring will be here soon! Start planning things you want to do when it’s warm. Do you plan to have a garden this year? Start looking at what you will want to grow and have the kids help pick out seeds. Grab some gardening books from the library and start learning about how things grow and what your seeds will need. Start learning about plants that will be blooming this spring. Figure out what parks you want to go to when it’s warm and dry. Ask the kids about what they would like to do when spring comes. Winter can often time feel like the longest season, especially if you live where it is really cold and there is often snow. Finding ways to bring change to our routine will help us better handle being inside and the cold grey days. 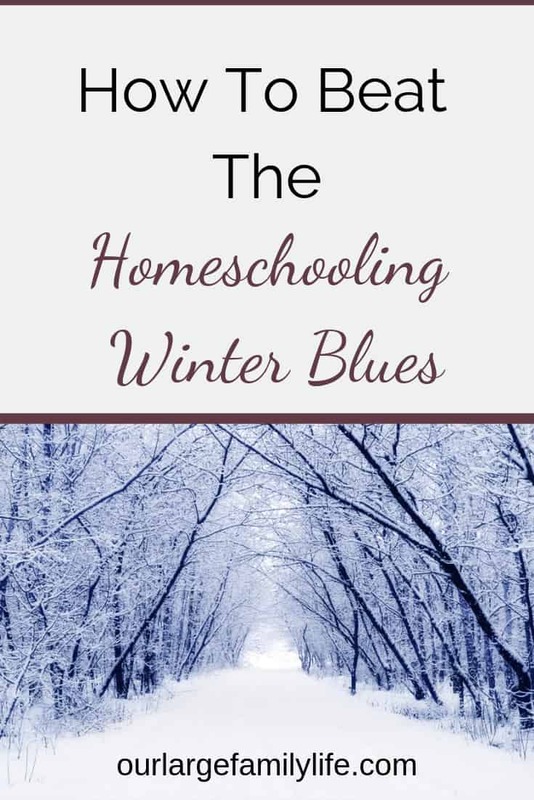 Look for different ways to add some variety to homeschooling this winter. Find a project or science activity to do. Go on trips to museums or local places for your kids to tour. Read a lot. Mixing your routine now and then will help you to not feel stuck. And remember, spring is coming! 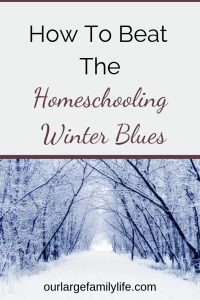 What do you do in the winter to change up your homeschooling routines?